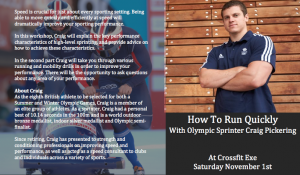 Two time Olympian and sprint expert, Craig Pickering, will be holding his ‘How to Run Quickly’ workshop at CrossFit Exe. This is a fantastic opportunity to learn from the best. Not only has Craig competed at the very highest level, but is also highly qualified in the science of running quickly. The workshop will be part presentation and part practical. The presentation will cover the principles and mechanics of sprinting and how to train effectively for faster, more efficient running. The practical will cover technical running drills, specific mobility and training practices for sprinting. Sprinting is an integral part of CrossFit training and this workshop will help bring about more efficient running, faster sprint times and improved workout results. Therefore, any CrossFitter interested in improving their sport should attend. The technical nature of the workshop means it will also be of great benefit to sports coaches, CrossFit coaches, personal trainers and students of Sports Science. You can book onto the workshop here: HOW TO RUN QUICKLY under ‘Courses’ or contact info@crossfitexe.com to secure a spot. Places are limited to 20, so be fast! This entry was posted in Gym news, Workshop.